I made a few changes to the entryway table. I added a little more color with this pretty pitcher my other sweet sister in law gave me for my birthday. I love it even more now. Okay...funny story. I often wonder if my husband notices when I change things around at home. I just want to tell you, he does. Do you remember when I shared the new quote I put on the entryway chalkboard? He asked me if I had read it and what it meant. Thinking he was up for some great philosophical conversation on the virtues of gratitude and being content and thankful, I assured him that I had indeed read it and thought it was a wonderful way to live our lives. He smiled and said, "Hmmm...I think you need to go back and really read what it says." So I obliged him and went back and read it out loud to him. "Are you sure that's what it says? Really read it." 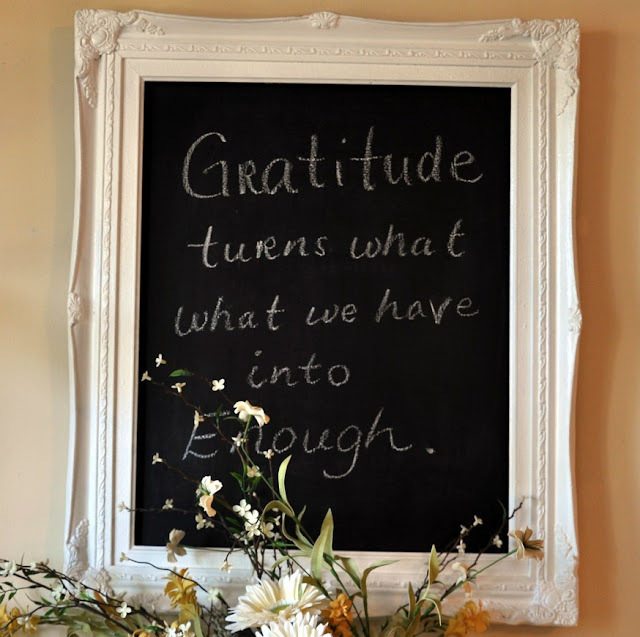 Gratitude turns what what we have into enough. Obviously, we busted out laughing especially when I told him I had shared the board on my blog! Ahhhhh, sweet perfection. I am so glad it's not expected or required of me. I would much rather laugh at my mistakes than cry over my imperfections any day. So funny! I didn't catch it either! I guess I'm not very observant... I never noticed the double 'what' before. Love the combination of yellow and greens.. so cheerful. Patty...what a FUN post! I was admiring that chalkboard just yesterday and never noticed the "what what"! Your entry table looks so pretty...love the bit of red. This is hilarious! I even copied and printed the picture for I wanted to put the saying on my blackboard. I never noticed the what what. Oh does our mind play tricks on us. Love your entry table with the touch of color. Still laughing also! Took took a minute . . . Smile! And I didn't notice it before, still don't...what!!!!! Hey- I am so glad I am not the ONLY one that makes those kind of blunders! LOL....Gotta love what a man DOES notice! Yes, you have to laugh. I didn't catch it either! Sharp eye, your fellow has!!! Love the vase and the whole vignette. That is too funny that your hubby caught that. Mine tries to keep up an notice my changes. Men. Your entry table is so charming. Love!
. Even with a second look I still missed it. I didn't catch the mistake right away & I consider myself observant. Oh well, so much for that! I didn't see it either but it sure is cute. I caught it but knew you probably didn't notice it. No matter. I do stuff like that ALL the time. I didn't notice the double what either. When I changed the name of my blog to Grandma Barb, I had it spelled wrong for several weeks until Karen at My Little Home and Garden mentioned it. No one else did. I don't know if they missed it or were just being polite. Lol! Love the way you styled your entry table. I kept reading it over and over and couldn't see what was wrong, not until you told us. I love "what" it says even with the mistake. Your entryway is so sweet and welcoming. Wow, I didn't notice it either! Seems our eyes compensate for what we see. Interesting, he is very observant...Watch out! The table looks so pretty. Did you paint it yellow? I didn't used to like yellow all that much, but I find as I get older I really like it. Such a HAPPY color. I read the sign three times and didn't get it, the what what. Isn't that funny? Surprised your husband noticed, I could move our couch into the front yard Richard wouldn't notice. He always tells me everything looks nice but I think he says that to keep himself out of trouble In case there was something he was suspose to notice. HA.